Hello everyone. If you followed my previous thread, you’d remember that I took Honey to a vet on Thursday because one of his nares was blocked. The vet cleaned it up and it went away however it has been slowly forming again. 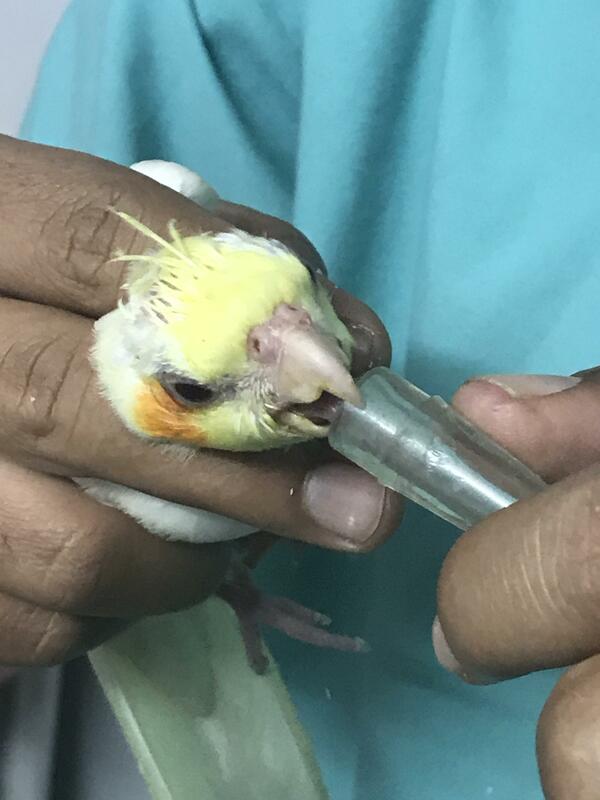 Since I live in India, it’s been incredibly difficult finding an avian vet after my previous one moved away. Well Yesterday, I finally found an avian vet. I called in to the clinic and asked if I could get an appointment and although they were busy and it is Sunday today, they said ok. The Vet was incredibly good and actually knew what he was talking about! He said that Honey has Rhinolith or nasal stones and that it may be because of Vit A deficiency. He gave medications - vit A drops, melonex syrup and doxycycline (3mg). He said that if it doesn’t clear up by Tuesday, I should bring Honey back in the morning and they’ll put him on a mild sedative and do flushing. After which, I’ll have to give nasal drops to him for a period of time. They also nebulised Honey for sometime. He seemed to like it a lot haha. Hopefully, everything goes well. The Vet also said that Honey is most probably a male (no testing yet - may get it done later). I know this may not be a *big* deal but I’m still nervous. He’s such a small lil guy and I don’t want anything to happen to him. Last edited by reeisconfused; 01-20-2019 at 12:15 PM. Ohhhh it sounds as if your Honey has great care. Take it one day at a time, hope for the best and trust you have what it takes to make it through no matter what. We’re all here anxious for updates. It's always a big deal when it's our baby!! Vit A deficiency is common on a seed diet. Start introducing those veggies! Especially yellow and red ones, then you don't have to worry about giving to much. Hope your baby is a ok! I am extremely exhausted from crying but I will try to be as brief as possible. Shortly after I made this thread, Honey aspirated on his medicine. He was fussier than usual today, maybe because he was tired from the vet visit. I was giving him his medicine (dosing - 0.3ml) and he was moving his head a lot, trying to jump away when suddenly he started choking. He opened his mouth and kept stretching his head backwards. No, this isn’t the first time I gave him medicine. I have done this with him many times before and this has NEVER happened. I immediately knew something was wrong. He kept on doing this for a minute and then he started sneezing as well. Soon after, there was discharge coming out of his nares and I knew that he was aspirated. 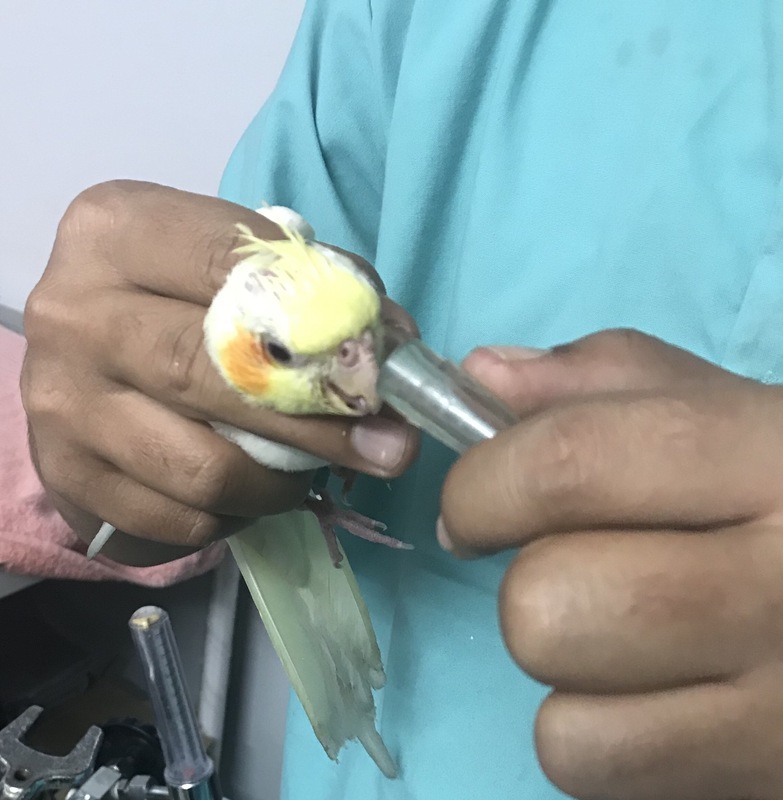 As I’ve mentioned before, avian vets are very scarce here and it’s incredibly difficult to get one during emergencies. Fluid discharge started around his eyes as well. My baby was choking, unable to breathe and I couldn’t do anything to help him. Thankfully, the avian Vet Honey went to earlier today does attend to emergency cases, if you call and ask him to. I immediately dialled his number and called him. I was crying so much on the phone that they couldn’t even make out what I said. They told me to come in immediately. I don’t have a car yet. I managed to Uber to the vet with my mom in 15 minutes (god bless the driver) and rushed Honey in. Open mouth breathing, Honey wouldn’t even bend his head. He kept closing his eyes and I was afraid I’d lose him any second. He was wheezing and there was a lot of discharge around his nares. The vet checked him and immediately told me that this was serious. For the next 2 hours, we were there at the hospital. They gave Honey some oxygen at first and then nebulised him a for a bit. The vet told that the best chance Honey had was to pass urine so that the fluid inside the lungs leaves. If the fluid went into the airsacs, it could get much more complicated. He promised me that he’d do everything he could but couldn’t guarentee that Honey would make it. I was devastated. I was crying the whole time I was there. All of this was a foolish mistake on my part. Maybe I should have been more patient. Maybe I should have asked my Mom to hold him when I gave him his meds. I can think of so many maybes but still it wouldn’t change what happened. The vet gave Honey an injection which would help him pass urine, hoping to clear the fluid in his lungs a bit. It worked on his part because Honey passed a lot of urine. Unfortunately, they don’t have a hospitalization unit for birds yet. Since Honey is so young, the Vet said that he’ll be giving meds to him through nebulisation. I have to bring Honey in tomorrow morning where meds for broncho dilation, inflammation etc will be given. He’ll be getting meds twice a day. The vet said that if Honey makes it the next two days, he’s safe. We’re back home now and Honey is a bit better. Still breathing with his mouth open but hopped on outside and on to my arm when I opened the carrier. He also chirped once (very weakly). I put him back in his cage and I keep checking on him every now and then. For now, he is sleeping. I feel so guilty and I cannot get over this. I have had Honey only for 2 weeks, but this little guy is my bundle of joy. He is absolutely in love with him and dances (literally!) whenever he sees me. He’s mischevious and funny and just SO good and I don’t want to lose him. Please keep him in your thoughts and prayers. I am so sorry you are going through this. It is so scary for me to give my bird oral medication because I am terrified that this could happen. You were doing what needed to be done, so don't blame yourself. Thank God your were able to get hold of the vet and I hope your bird improves. If it helps, another member had a similar issue with a tiel and theirs pulled through. Oh so sorry, so scary. My prayers are with you and Honey!! Hope for a speedy recovery! Two weeks or two minutes , they steal our hearts!!! Last edited by EllenD; 01-21-2019 at 09:50 AM. I’ve got Honey in my thoughts. Sending you all my hopes and every good wish for you and Honey, you’re both in my thoughts.